Includes Audio and Video Access! 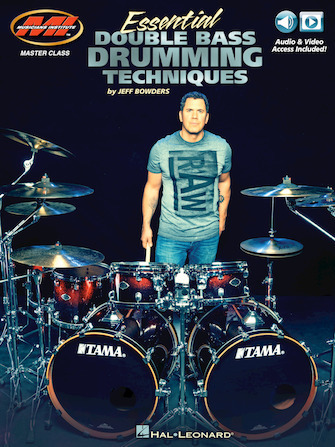 This comprehensive resource covers virtually every aspect of double bass drumming. By revealing the value of proper balance and foot technique, then applying those concepts to various warm-ups, mirrored grooves, fills and progressive phrasing applications, you will be thoroughly prepared for any musical situation demanding double bass proficiency. With nearly 200 pages of printed instruction, online access to 130 audio tracks, and over an hour of video content, this package is a must for double bass drummers of all levels. Topics covered include: practice suggestions • balance/foot technique insights and overview • dynamic warm-ups • mirrored double bass grooves based on 8th-note, 16th-note, 32nd-note and triplet feels • fill development using drum and cymbal orchestrations • phrasing concepts applied to grooves and fills.